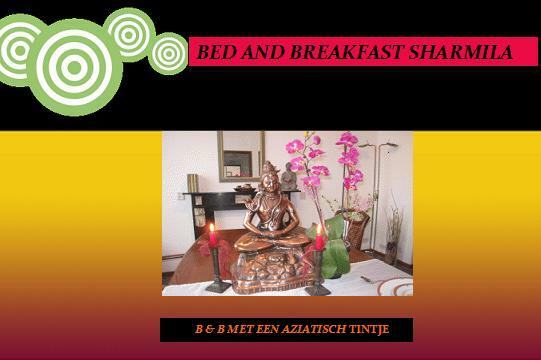 Welcome to Bed and Breakfast Sharmila Maastricht. For relaxation and personal attention with an Asian twist you are at the right place at Bed and Breakfast Sharmila Maastricht. In our house you will find space and privacy as an entire floor at your disposal. The floor is fully furnished with a bedroom, living room and private bathroom. Breakfast is served in the authentic tiled dining room. Surinamese/Indonesian dinner is possible in a homely and relaxed atmosphere. If you have special needs, please let us know. Our house is situated in the center of Heer and has a nice shopping center. The city is on walking or bicycle distance and from our house you can also make beautiful walks and bike/motorcycle trips into the hills. Covered and closed parking for cars, motorbikes and bicycles available for a fee. We also rent bicycles and there is a bus stop just steps away. A playground is nearby. Maastricht is a historic city with much to offer in the field of art and culture (MECC, Tefaf). There are excellent restaurants, wonderful shops and everywhere you will find cozy terraces. In the surroundings you can go hiking or cycling. Aachen, Liège and Tongeren are about thirty kilometers from Maastricht. By car you are within an hour in Brussels, Antwerp, Düsseldorf, Cologne and Bonn. Valkenburg and Gulpen are ten kilometers from Maastricht.